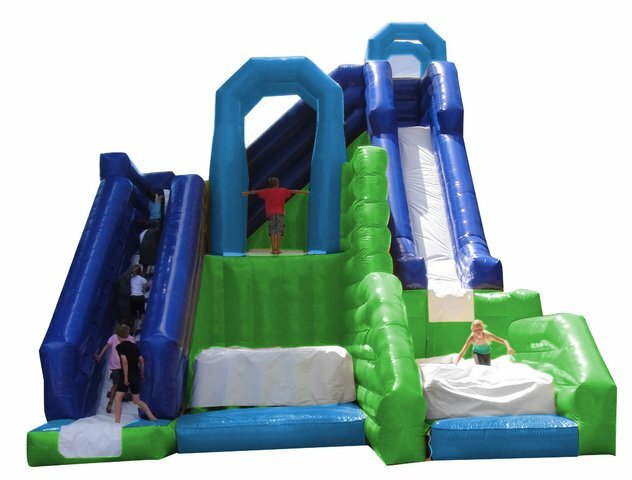 This great event piece is a triple fun Jump N Slide inflatable amusement game features three activities (climbing, jumping and sliding! ), two super-soft Zero Shock landing zones and one guaranteed good time for all. The Jump N’ Sliders start by climbing the stairs to the first platform. Once there, they can choose to jump into the first green Zero Shock jump zone below or climb even higher! If they choose to climb one more set of stairs to the top platform, they can then slide down a massive blue slide into a second green Zero Shock zone. WE MUST BE ABLE TO GET THE TRUCK AND TRAILER WITHIN 5 FT OF THE SET UP LOCATION FOR THIS ITEM.